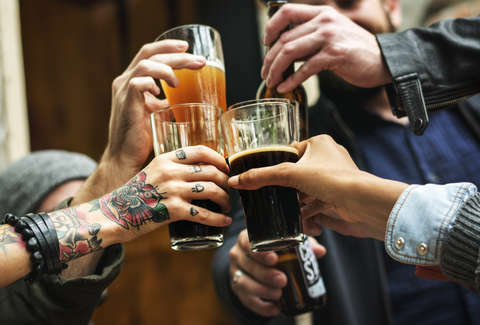 That there's basically a craft brewery in every neighborhood in some cities has been a godsend for those of us love to sample local, limited-release, and sometimes experimental craft beer. While some of the more than 6,000 craft breweries will always be super small and hyper-local treasures, others will make it "big," which depending on how you view that, could be a good thing or a bad thing. 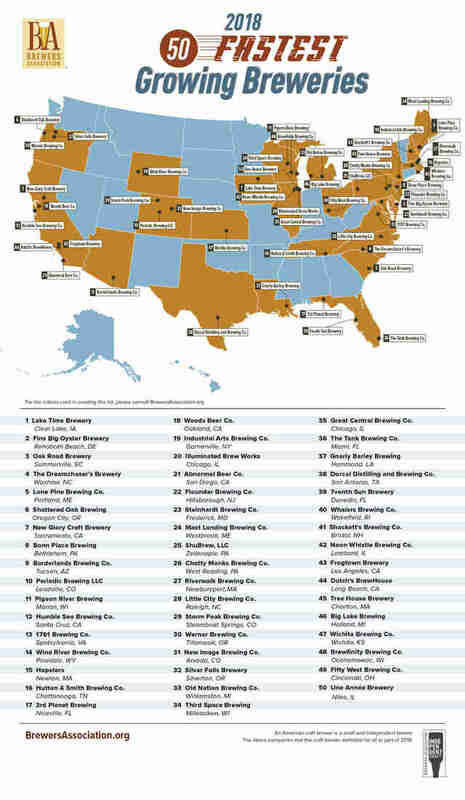 But whether you like it or not, craft beer continues to expand, and now, a new map reveals the 50 fastest growing craft breweries in America. Compiled by the folks at the Brewers Association, a non-profit that represents small and independent craft brewers, this new map highlights the 50 craft beer operations that saw the biggest year-over-year production growth in 2018. That's not to say it showcases the ones that are pumping out the most barrels, but rather the ones that saw the biggest relative boost in production. In fact, the median size of the the fastest-growing group shown here is just 1,350 barrels produced in-house annually (for context, 202.2 million barrels of beer -- both craft and otherwise -- were sold in the US last year alone). In all, breweries in 27 states have been recognized, though there's pretty good showing from every area in the country (the Midwest and Northeast are particular standouts). Taking the number one spot is Lake Time Brewery in Clear Lake, Iowa, followed by Fins Big Oyster Brewery in Rehoboth Beach, Delaware, and then Summerville, South Carolina's Oak Road Brewery. You can take a peek at the top 10, and the full list in the infographic below. Considering the bulk of these breweries don't (yet) have a big imprint, it makes sense if their names don't ring a bell. However, for the craft beer hobbyists out there, consider this a list of the spots to keep your eye on. You never know which little-known small-town outfit today could become tomorrow's Sierra Nevada, Dogfish Head, or Bell's.